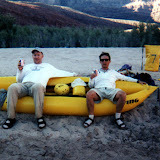 I went on a 6 night rafting trip through the Grand Canyon with my buddies Kevin from California and Horst from Vienna. It was awesome. Here are my pictures, followed by Kevin's and Horst's.